Continue to be who you are. Home / Adviart Blog / Continue to be who you are. Continue to be who you are. This adviarter picked this shell because of the large surface area and open center to draw radiant lines across the shell. The advice was to “continue to be who you are.” The red used to represent passion/fire and the lines radiating out of the center of the shell. No words were used–only a drawing. This adviart has a continual pulse to it–continuing would note a moving forward of time and that being who we are is already happening. This adviart is a lifelong challenge–there is no end date. 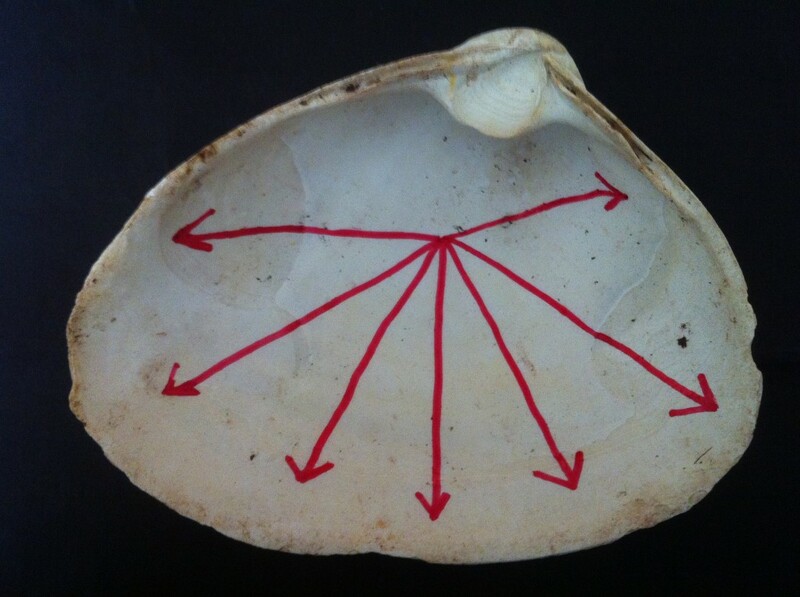 The directions of the arrows showing that being who we are can go in many different ways. The conversation around this advice including topics such as music, Hinduism, Buddhism, and Christianity. The adviarter a starting point for more in-depth conversation. Being who we are is an ideal–requires that we have the ability to have our needs met to lead as we want. Continuing is typically a word that I stay away from because for some reason I think that is doesn’t allow change. In this case however, I can see that being who we are can incorporate change over a time continuum. So how do you ensure you are being who you are and making the most impact?